A new roof is a big investment, typically involving thousands of your hard-earned dollars and lasting 25, 30, 40 years, or more. As with any big investment, knowing in advance what your warranty covers could save you thousands in the event that problems arise with your roof. What Are The Chances Of Having A Problem With My New GAF Roof? Based on our state-of-the-art manufacturing process, the odds of having a problem with a new GAF roof are minuscule. On the other hand, while serious problems with GAF roofing materials are rare, if you were to have a problem, it can be as expensive to fix as your roof originally cost. So while the risk of having a problem is low, the cost if you do have a serious problem can be high. What About Problems With Installation? GAF’s studies indicate that more than two-thirds of the problems that people experience with their new roofs are due to the contractor’s workmanship — not the roofing materials. This is an important distinction to keep in mind when deciding on warranty coverage. Basically, there are two types of coverage that you should ask your contractor about: coverage against manufacturing defects in the materials and coverage against workmanship errors. As far as we know, all manufacturers provide a warranty against manufacturing defects for their roofing products, although your exact coverage will vary depending on the brand. For example, a typical shingle warranty will cover manufacturing defects for a period of 20, 30, 40 years, or more. The warranty on the other components that make up your roofing system can vary from as little as a few months to several years. It is important to remember that coverage against manufacturing defects is provided by the manufacturer, so you should select a brand from a manufacturer who is financially strong and therefore more likely to be in business for as long as you own your roof — which could be several decades! What Is GAF’s “Smart Choice® Protection Period”? 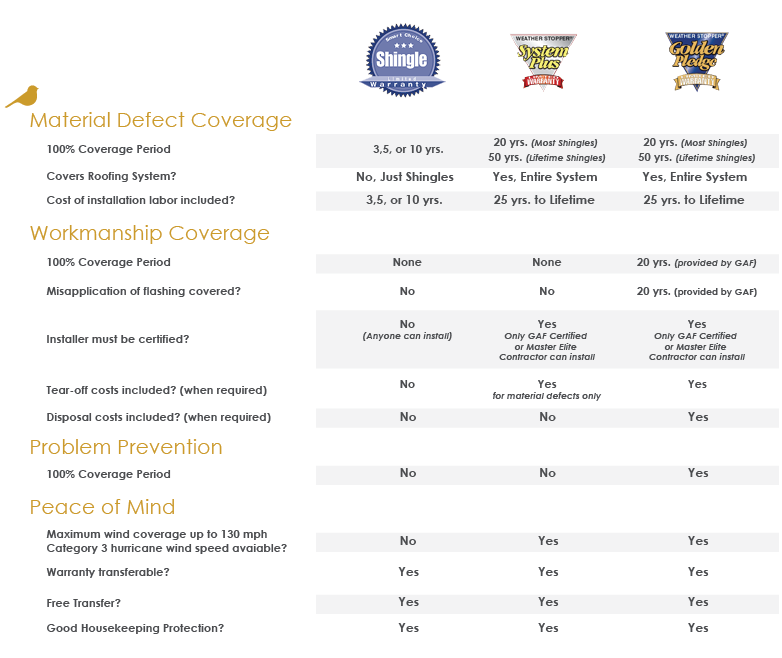 GAF’s warranties come with a special provision called the Smart Choice® Protection Period that provides extra coverage against manufacturing defects during the critical early years of your new roof. During this period, in the event that you experience a manufacturing defect on covered components, GAF will provide you with 100% replacement materials and the reasonable cost of labor to install them. This is important because some roofing warranties may only provide replacement materials, but not the labor to install them. What Is The GAF Weather Stopper® System Plus Ltd. Warranty? The GAF Weather Stopper® System Plus Ltd. Warranty provides coverage against manufacturing defects for all major GAF components on your roof (not just your shingles) — so you’ll have the peace of mind of knowing that, if any covered roofing component fails, it will be covered by the warranty (see ltd. warranty for complete coverage and restrictions). The warranty is available through GAF’s factory-certified contractors, and is a low-cost way to get up to 50 years of non-prorated coverage (against manufacturing defects) on your new roofing system. For the small additional cost of the System Plus ltd. warranty, this is probably the best value you can get for your investment. How Can I Also Get Coverage Against Workmanship Errors? Many roofing contractors provide their own warranty against errors in workmanship, sometimes for as long as ten years or more. Obviously, that coverage is only good for as long as the contractor remains in business. Since roofing is a “high-turnover” business, the majority of roofing contractors are out of business within five years — far less than the life of your new roof — making their warranty worthless and leaving you with nowhere to turn in the event that you have a workmanship problem. Are There Any Manufacturers Who Will Cover The Contractor’s Workmanship? GAF’s Golden Pledge® Ltd. Warranty was the first manufacturer’s warranty to cover both manufacturing defects and the contractor’s workmanship (see ltd. warranty for complete coverage and restrictions). Whether or not your contractor remains in business, GAF will stand behind his workmanship for 25 years! The Golden Pledge® Ltd. Warranty is available only through GAF Master Elite™ Contractors, who are factory-certified by GAF. The warranty even includes an inspection by GAF’s factory-trained inspectors after your new roof has been completed to ensure proper installation. It is the strongest, safest warranty available in roofing today. Your Master Elite™ Contractor can provide a price for the warranty when he gives you a quote for your new roof. To print our warranty information, download our Warranty Guidelines. Let us handle your regular maintenance & repairs, protect your home with the Overhead Care Club™! • Guaranteed Appointments within 24 hours! Monthly Investment of only $14.95. Call us today for more information or to get started!